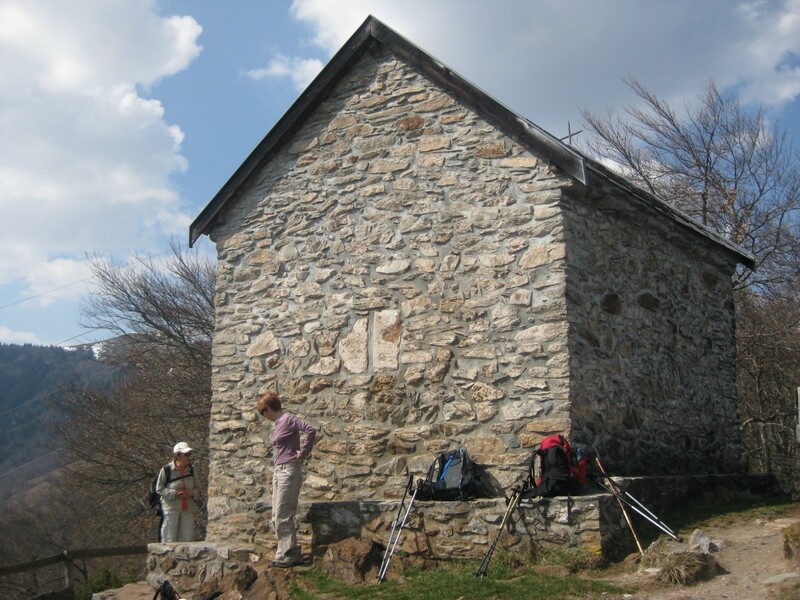 Our walk today was to the Chapelle de Saint Barthélemy, high in the Vallée d’Ax, beyond Tarascon. 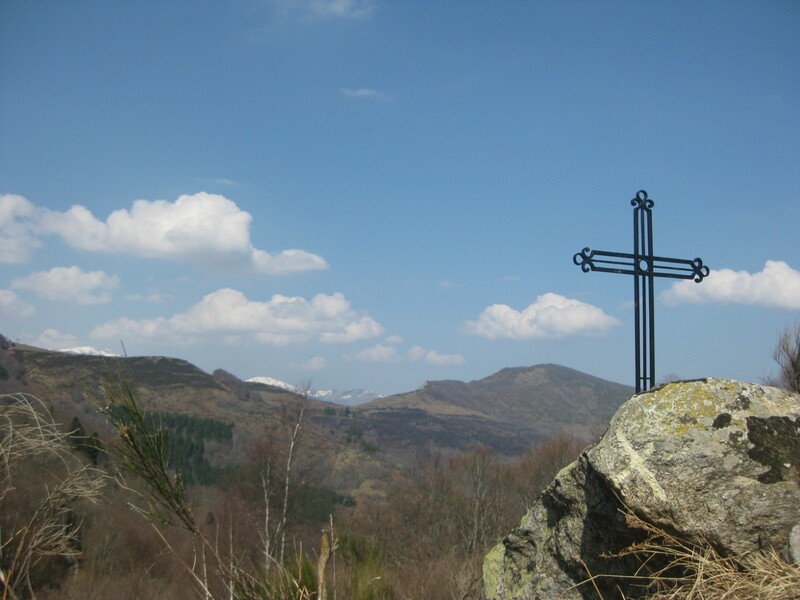 We quickly realised we were on a pilgrimage route – our path was marked by decorative iron crosses. But none of us knew why. Now I know, and it’s a grisly story. Back in 1854, cholera hit the area. It’s hard to see how it spread in such a thinly populated region, where every settlement is surrounded by forest, fields and pasture. 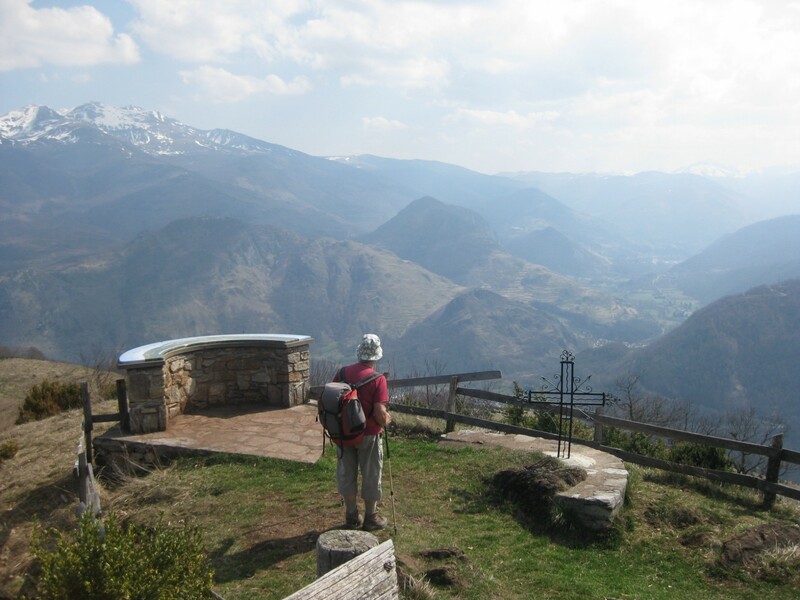 Our drive up to the little village of Larnat, where we parked to begin our walk, was up and up a long single track road characterised by an unending series of hairpin bends – and no villages or farms on the way once we’d left the lower slopes. The road to Larcat is up a similarly tortuous route. But despite this, cholera did arrive in the area, and when it struck, the people of Larcat didn’t hesitate to massacre the poor family responsible. In time, the few survivors built a tiny chapel at the summit, dedicated to Saint Barthélemy, and promised an annual pilgrimage. This chapel is a very simple windowless structure. Some garden sheds are bigger. It enjoys splendid views in every direction, and provided the perfect lunch-spot. Ignorant of the bloody events that had caused the chapel to be built, we had a pretty easy feel-good walk. The slope upwards was a gradual one, through forest tracks, emerging eventually onto an airy path commanding view of the mountains which surrounded us. 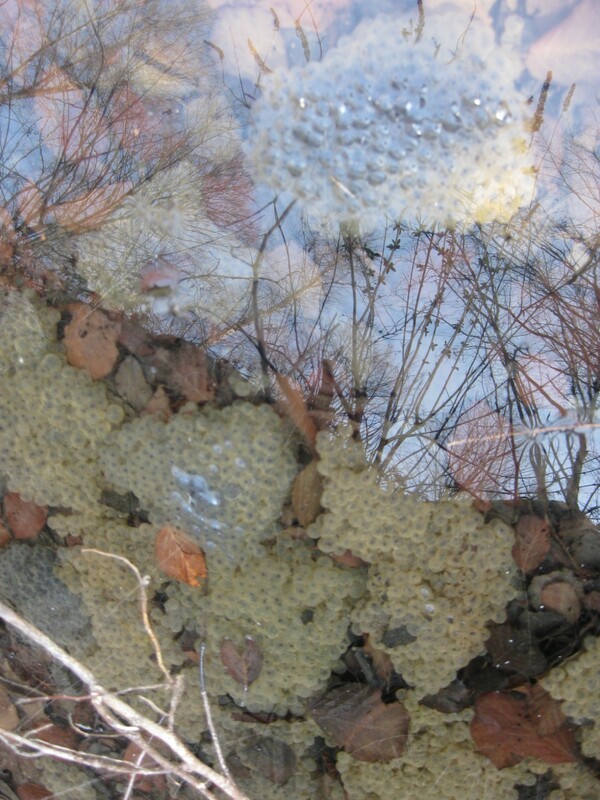 We had time to enjoy the emerging spring flowers –chiefly wood anemones and cowslips – and spotted several clumps of frogspawn. Did I know, Jean-Claude wondered, that when he was younger, it was quite common to see men staggering back from a country walk with hessian sacks stuffed not with the potatoes for which they were originally intended, but frogs destined for the market and then the dinner table? I didn’t, and was glad to hear frogs are now protected and it’s illegal. Apparently, though I’ve never seen them on the menu, frogs are still eaten. Now however, they’re imported from China. They certainly weren’t on offer today. As usual, the day finished with tea and cake: much more welcome. Now the story of that cholera outbreak would make for a tragic story. I wonder are there any more details of the village and the family? I’m quite motivated to find out now. Let’s see…..
We did this walk a few years ago with the “children” and really enjoyed it. 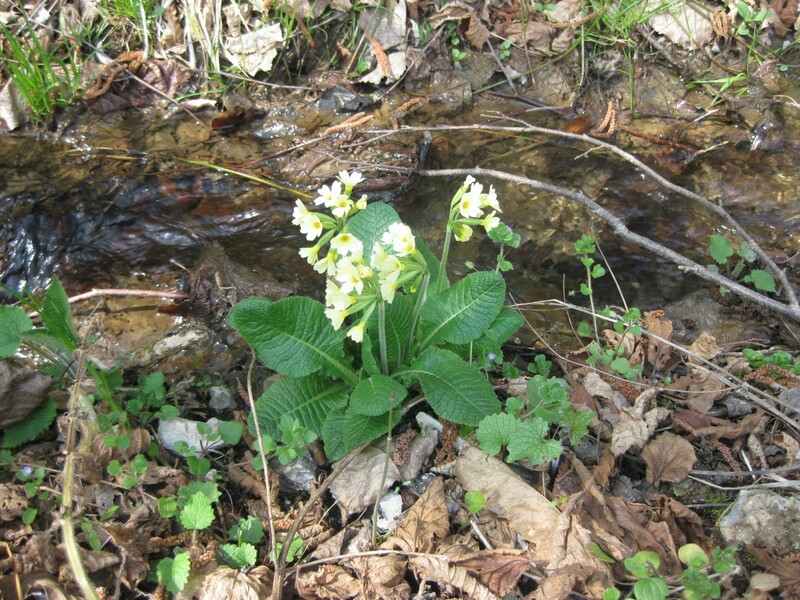 It was later in the year so the flora were different and we saw beautiful butterflies and reptiles. Didn’t know about the cholera tho’. It took some digging out from the net. I’d like to know more. Such a tragic tale – but I too want to know more…..someone must know. I’m going to have to find out, aren’t I? OK. I’ll see if I can rise to the challenge. I usually find our friends are quite clued up about the history of this area, but they’ve failed me this time. I wonder whether the local people still honor the pilgrimage pledge? In my wife’s ancestral village, they still have an annual walk of penitence. As for frogs legs, they certainly still are on menues in France. My wife and son had them in Lyon a couple of years ago, and they were on the menu norht of Strasbourg last year when I took a bike trip along the Rhine. They are pretty expensive, given the small amount of meat on the legs. By popular demand, I’m going to need to find out more about that chapel and all that goes on – or doesn’t – there. But I’ll pass on the frogs’ legs.